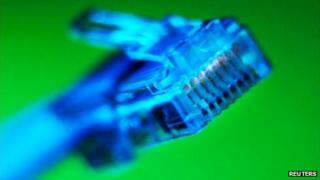 Broadband speed should be guaranteed, says Which? Image caption Providers should go further in guaranteeing broadband speed, says Which? A survey carried out on its behalf claimed that 45% of customers suffer slow download speeds. Over half of those customers said they experienced slow speeds frequently or all the time. Ofcom said measures were already in place for customers suffering with speed-related broadband problems. "The internet is an essential part of modern life, yet millions of us are getting frustratingly slow speeds and having to wait days to get reconnected when things go wrong," said Which? executive director Richard Lloyd. "It's less superfast broadband, more super-slow service from companies who are expecting people to pay for speeds they may never get." Ofcom already has a voluntary code of practice on broadband speeds in place that it says ensures customers are protected. Providers who have signed up to it must give customers a written estimate of their broadband speed at the start of a contract and must allow them to leave a contract without penalty if they receive speeds significantly below the estimate. Media captionThink Broadband editor Andrew Ferguson tells 5 live: "It is a postcode lottery"
"Ensuring consumers receive a high quality of service from their broadband provider and are fairly treated are high priorities," said an Ofcom spokeswoman. A mystery shopping exercise carried out by Ofcom revealed that the code was working effectively, she said. However, there were areas where it could be improved and a revised code of practice would be published in the coming months. Which? said in practice it supported the code but it was voluntary, not compulsory and providers needed to go further. Rather than providing an estimated speed range that a customer could expect to receive, providers should pinpoint a more accurate speed that customers can expect at their home address and provide this in writing. This written confirmation should be accompanied by information explaining what consumers can do at different speeds - what they could download and how long it would take - and how to test their speed, Which? said. The customers who took part in the survey were asked if they had experienced buffering or slow downloads when using their broadband connection. They were not asked if they had measured their own connection speed, which can be done using speed checking websites. Nor were they asked in what circumstances the slow speeds were experienced - for example, whether several people were sharing the connection to download large files or whether a wired or wireless internet connection was being used. According to the survey of 2,000 people, a quarter of those who had reported a loss in service said they had had to wait two days to get it fixed, with one in 10 waiting a week or more. Twenty per cent said they had contacted their internet service provider at least three times when trying to resolve a problem with their broadband connection. Which? is calling for broadband companies to fix connections as quickly as possible and refund customers for any loss of service. "Broadband providers need to give customers the right information and take responsibility for resolving problems," said Mr Lloyd.